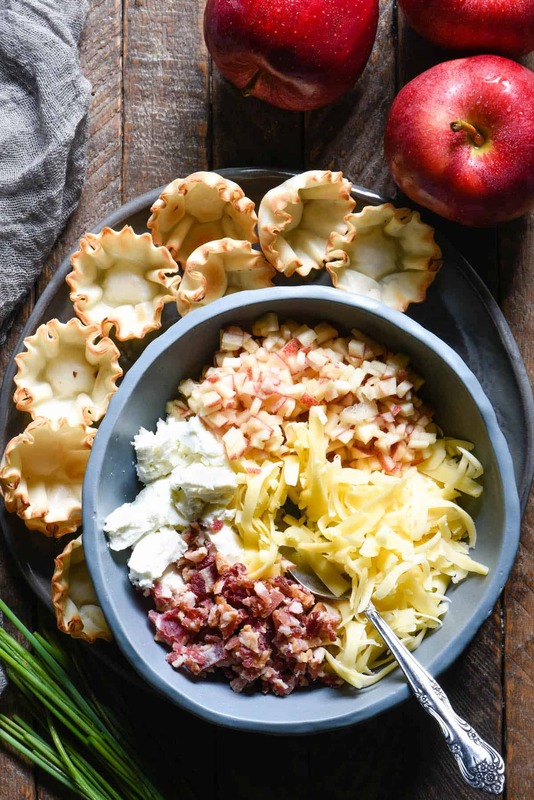 Update your holiday snack spread with these Cheesy Apple & Bacon Phyllo Cup Appetizers – a modern take on a cheeseball and crackers. There’s a few things that I like to keep on hand for quick entertaining snacks that seem fancy, but are so easy. Marcona almonds, good olives, fresh fruit (like Michigan Apples, of course!) and a few good cheeses all make the list. Another item right there at the top is mini phyllo cups. These little edible cups (sometimes called “phyllo shells” on their box) are most often found in the freezer section of any grocery store (look near the puff pastry and other frozen pastry items), but can also be stored at room temperature if needed. 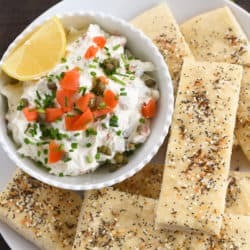 They’re made with layers of phyllo dough, a light and flaky unleavened dough used in Greek and Middle Eastern cuisines. People are most often familiar with phyllo dough in baklava. Phyllo shells are a favorite of mine because they are SO adaptable. They can be filled with any variety of filling, from sweet to savory or somewhere in between. 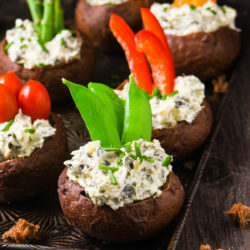 If you store them in the freezer, simply put them on your counter as you prep your filling, and they’ll be at room temperature and ready to eat by the time you’re ready to fill them. They can be served straight from the box, or baked if you want. Like I said, SO easy. 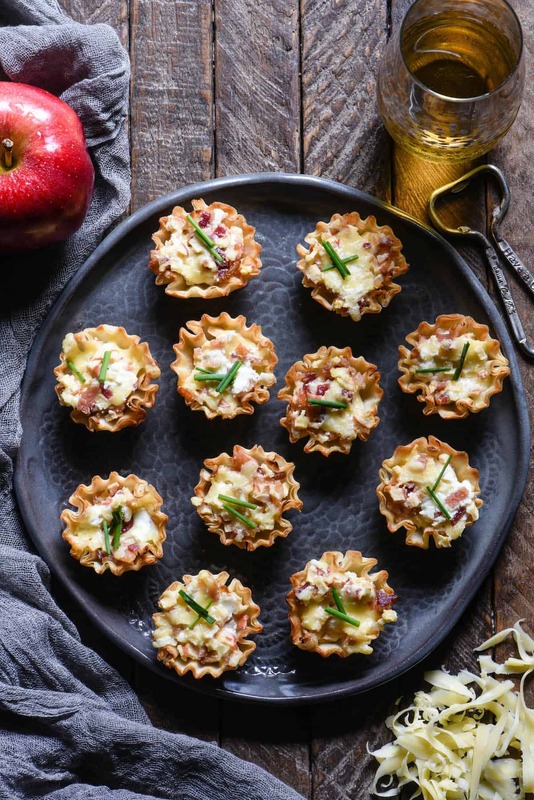 These Cheesy Apple & Bacon Phyllo Cup Appetizers are my modern take on a cheeseball and crackers. 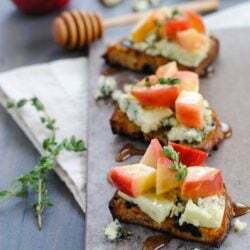 Updating your holiday snack spread couldn’t be easier – simple stir together cooked bacon, goat cheese, gouda cheese, a dash of hot sauce, and some chopped Michigan Gala apple. I always have Gala apples in my crisper because they are perfect for eating on their own AND cooking. You can’t go wrong with them! Scoop the mixture into the phyllo cups, and from here, you can serve these bites at room temperature, but I like to pop them into the oven so the cheese gets all golden brown and melty. Your holiday guests will be coming back for seconds and thirds of these savory-sweet little bites, I promise! Preheat oven to 350 degrees F. If phyllo shells are in freezer, place on counter to bring to room temperature. In medium bowl, stir bacon, apple, goat cheese, gouda and hot sauce until well combined. Place phyllo shells on rimmed baking pan. Divide cheese mixture between phyllo shells. Transfer to oven and bake 15 minutes or until light golden brown. Mini Baklava Tarts – way easier to make than traditional baklava! 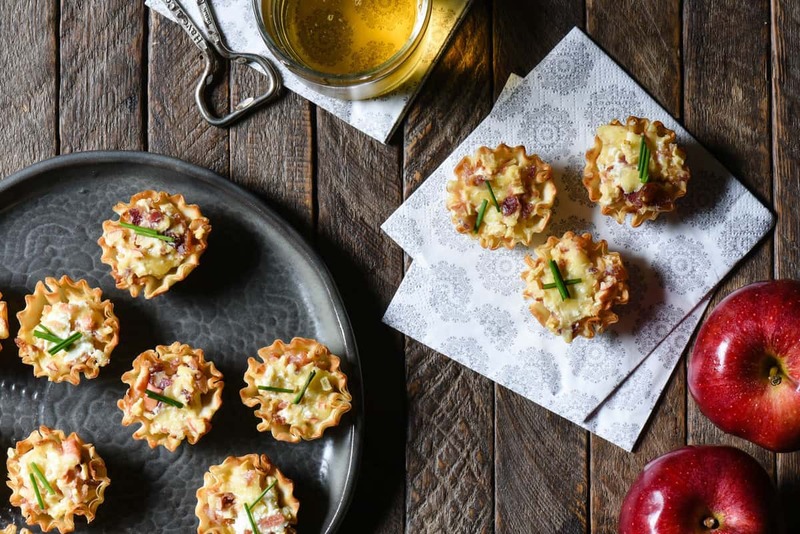 Smoked Salmon & Avocado Mousse Phyllo Cups – great for brunch. I’ve never been a fan of cheese balls, but these little pastries sound wonderful. I don’t have any excuse to make them, but am definitely saving the recipe, for just in case. I wonder if you could make a small batch just as a snack for you and your husband? The leftover phyllo shells could be kept in the freezer and you could maybe make a half batch of filling (or a full batch, and just eat it over a few days). Anyway, I hope you have a lovely Thanksgiving, Susan. Thanks so much for being such a loyal reader. It means a lot to me. Thank you Lori. I wish a wonderful Thanksgiving also. A small batch for snack sounds like an excellent idea.